Is AT&T Conferencing available for all services? Who can use conference calling? What devices can I join a conference call from? 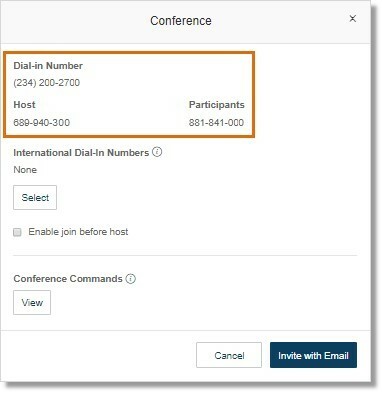 How do find the conference calling host and participant number? What are the feature benefits of conference calling? How can I use conference calling? What are the international dial-in numbers for conference calling? How many particpants can join a conference call? Can participants join a conference before the host? How do a promote my local conference on the Office@Hand Desktop app to accommodate more participants? What is the difference between Office@Hand Meetings and Conferencing? Office@Hand Conferencing enables Office@Hand customers to setup and join conference calls anytime, anywhere. Each customer receives a conference bridge number and every user has an individual access code to host a conference. With the ‘invite’ feature, users can easily and quickly email conference details to participants. Office@Hand Conferencing includes mute controls, listen only mode, record conference and more. The feature is available to Premium users only. Anyone who receives an invitation can join, but only AT&T Office@Hand users can host a conference call. You can join from your desk phone, your computer using the AT&T Office@Hand Desktop App, or using tablets and mobile devices including iPad, iPhone and Android phones. How do I find the conference calling host and participant number? To find your conference host and participant dial-in numbers, log in to your AT&T Office@Hand Online Account, Office@Hand Desktop App, or Office@Hand Mobile App. The information will be displayed in the conference section once you are logged in. Your conference details are found on the online account. Click the Conference button below the Get Help link. The Conference pop=out window displays your conference details. What are the benefits conference calling? Host controls allow for muting attendees, listen only, recording conference, and a lot more. Join as a Host with one tap on your mobile phone to instantly start a conference anytime, anywhere. Conference from your office with your desk phone, desktop and mobile app ( for iPhone or Android) while on the go. Music-on-hold is prevented from playing, thus answering incoming calls or placing the active conference on hold will not disrupt the conference. Each Office@Hand customer receives a local conference bridge and host/participant access codes per user. Conference details, including invite and host controls, are available on the service web and on the smartphone app. Invites can easily be sent to other participants via email. You can easily use conference calling by getting your conference details from your online account. You can use the Dial-In Number on your desk phone, desktop or mobile app. When prompted, dial your host or participant access code. See Conferencing – International Dial-in Numbers | AT&T Office@Hand for the complete list of international dial-in numbers. How many participants can join a conference call? Each conference call can support up to 1,000 participants, including the host. Can Participants join the conference before the host? Yes. Hosts can enable this on the online account by clicking on the Conference button below the Get Help link and clicking the Enable join before host checkbox on the Conference pop-up window. There is a 6-hour limit per conference call, but no limits on the number of conference calls. How do I promote my local conference on the Office@Hand Desktop App to accommodate more participants? When you add people to a multi-party call on the Office@Hand Desktop App, it’s called local conference and has a limit of 7 participants. You will be able to increase the number of participants when necessary using the Office@Hand Conference feature. This eliminates the need to manually end an ongoing call when the multi-party call hits the 7-participants limit. This feature is available right after the multi-party call is created. After the 7-participants limit, all participants will be transferred to the Office@Hand Conference bridge and an invite to the conference option will be visible on the Office@Hand conference screen. See Promote Local Conference – Desktop App | AT&T Office@Hand for more information. Office@Hand has an array of platforms that allow you to communicate via audio call or a video call. Conferencing is mainly an audio-only call with multiple participants via any phone, while Office@Hand Meetings allows you to set up an online video conference on your computer.